Think of Turkey, think of coffee! 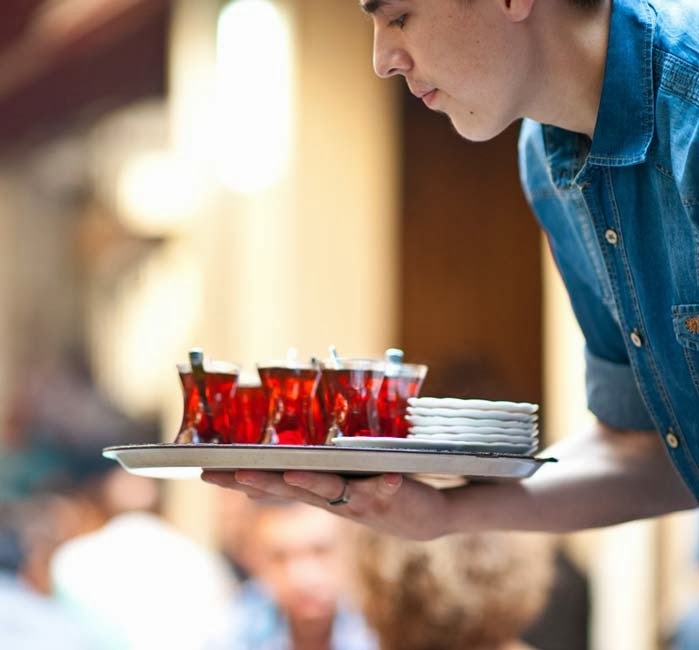 However, Turkish Tea is just as common as coffee and in some ways more a means of communication. Wherever you go, people drink tea and will invite you to join them for tea and a chat. Tea is cheap - often as little as 40c or 50c for a cup. Try finding that in Australia. People of all ages drink tea - young, old, in between; as individuals, lovers, family groups. Often, Turkish Tea is served with range of very sweet, delicious cakes including baclava, cezerye and pekmez. So, if you want to get to know Turkish people and learn the language simply visit one of the thousands of outlets that serve tea on your own or with just one other person and very soon you will strike up a conversation. Tea drinking is the essence of Turkish life. Memories of the young man carrying the tea tray around the Grand Bazaar to serve the stall sellers. And the samovar where tea is brewed (literally) all day and served in elegant tulip glasses with cubes of sugar resting on glass saucers. And especially our visit to a jewellery shop in Antalya and drinking tea with a man and his beautiful teenage daughter.